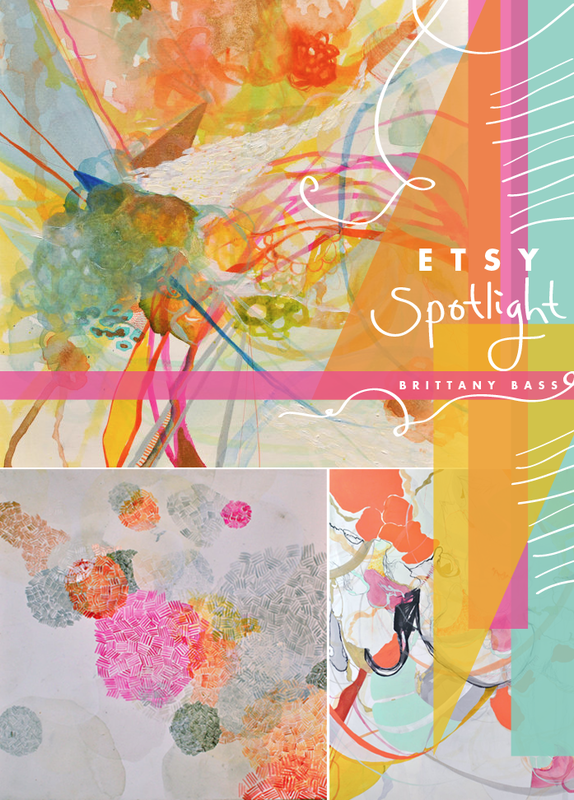 I have been so excited to share the work of Brittany Bass for quiet a while now! I have seen it pop up on other blogs since finding her months ago and I should have wrote about about her work then but I wasn’t ready to start this regular column…BUT now finally I can share her amazing work with you all. I am a huge fan of abstract pieces. I am not very realistic in my own life so when I see someone expressing their world through color, texture, line, and form I am always intrigued. What originally grabbed me with brittany’s work is the small textured details and her color choices. For instance check out the bottom left image it is called Fireworks…I loved it the moment I saw it but after knowing the name I fell even more in love. You can feel the pop of the explosion in the hot bright hues and then the fading of the excitement in the others. Finally the water marks have the texture of the smoke and all at once I am sitting on a dock watching the sky light up with color. It’s amazing but because of the lack explanation you are able to bring your own memories, thoughts, and imagination so no one individual sees it the same as another. That’s where I geek a little. The other thing she does is the melding of mediums, which I am a huge fan of as a graphic designer. Growing up I would cut magazines and paint over them to create texture, expression, and emotion. So I gravitate to work like this. As a designer I am incredibly inspired by work like this and believe she is an artist to keep your eye on. I think she is going to be a rock star very quickly. All in all I have a total art crush on Brittany and she has an adorable tumblr so make sure you follow her. Then check out her personal website outside of Etsy oh and she tweets. Happy Tuesday you all! Later this afternoon I am sharing Bryan and Mae’s invites that are headed to print today! Kind of pumped to share!